The JP Short Range Tactical Sight is the ideal solution for supplementing a long-range optic or precision iron sight setup where fast, reflexive short-range engagement from point-blank to 35 or 40 yards is a necessity. Our local police department started using the JPSRTS as their backup system on M4-type carbines with EOTech main optics because when moving from extreme cold weather to warm, humid building interiors, they found their optics fogging up rendering them useless. They needed a non-co-witnessed sighting system available without having to remove the main optic, and the JPSRTS was the perfect solution. 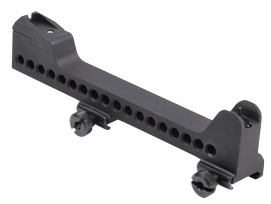 The JPSRTS is adjustable for point of impact and is quick-detach on all JP Tactical Rail accessories. The current generation SRTS is also in the same sight plane as a standard A2 sight system, allowing the operator to switch sight system without changing his cheek weld. Supplied with five colored front inserts, the front sight now uses the traditional plunger retention method and will support many aftermarket front sights while the rear will readily accommodate a standard Novak rear sight with tritium lighting if night sights are needed. These top-quality flip-up iron sights from Troy Industries are available in both standard M4 and micro heights. Depending on your preference, either height works well mounted at 12:00 for co-witnessing or at a 45° offset for a rollover secondary backup sight application. Both the JP Modular and RC hand guard systems allow for any such configuration with both front and rear placed on the tube. If a longer sight radius is preferred, the rear sight can also be mounted using the JPROS (rail offset adapter) on the receiver. These sight sets assume rail mounting on receiver and hand guard position, not gas block position.